Tulikivi's Harmaja fireplace combines the quick heat release of a wood stove and radiant heat of a masonry unit for a cozy environment that lets you wake up warm. Tulikivi's Harmaja fireplace provides affordable luxury and radiant warmth. The Harmaja is perfect for areas that homeowners would like to warm up very quickly, while also enjoying a comfortable heat for up to 16 hours, so you don’t wake up cold. Imagine setting a blazing fire in the evening, relaxing in front of your fireplace, then turning in for bed free of worries about the flames. Best of all, you snuggle in for a cozy night’s sleep and never wake up cold. It’s no longer a dream. Tulikivi, the world’s largest manufacturer of heat-retaining fireplaces, will introduce its popular Harmaja (har MY ah) soapstone fireplace in North America and Canada, the company announced today. The product extension of Tulikivi’s soapstone fireplace line will be introduced at the Hearth, Patio and Barbecue Association Expo this week in Atlanta. “The Harmaja is perfect for areas that homeowners would like to warm up very quickly, while also enjoying a comfortable heat for up to 16 hours, so you don’t wake up cold” adds Johnson. 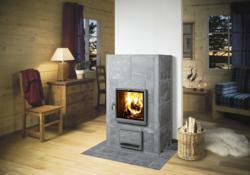 Plus, the Harmaja functions as a versatile stove and oven. Its unique cooking rack lets you take advantage of high heat to flame broil everything from burgers to brats, while you can utilize its thermal heat for slow roasting meats, vegetables and stews. It’s eco-friendly, too. Coals burn hot and complete, ensuring low emissions. The Harmaja further cements Tulikivi’s reputation for elegance, sustainability and unparalleled quality in design and materials. As is standard, the Harmaja unit is made of hand-cut Finnish soapstone, features durable doors and finishes, and comes with a five-year warranty.